Since launching in February, Y Combinator grad Crowdtilt has been on a mission to become the easiest way for friends and groups of people to raise money for any cause. Last month, the group-funding platform added deeper support for non-profits and charitable fundraising initiatives by enabling users to make tax-deductible donations to 501(c)(3) organizations and receive auto-generated tax-deductible receipts. The startup has been looking for business development opportunities and ways to increase its reach, both among non-profits and startups. Crowdtilt is today adding another piece to its customer acquisition strategy with the (beta) launch of its API. 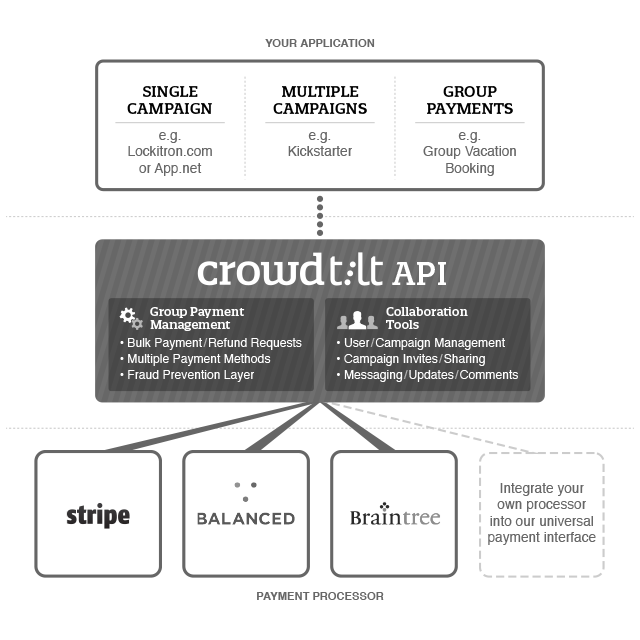 With its new API in place, Crowdtilt now enables third-party developers and businesses to quickly tap into its group-payment capabilities. Simply put, the startup’s API will provide an off-the-shelf solution to handle group payments, allowing developers to choose from a handful of popular payment processors, like Stripe, Balanced and Braintree, integrating that technology into their apps and products. The API also provides collaboration tools like comments, updates and messaging, enabling businesses to offer a group payment option during checkout, a pre-sales commerce option, as well as the ability to develop a social, crowdfunding application — either for single projects, like Lockitron, or multi-project models, a la Kickstarter. The hardest part about building a crowdfunding application, says Crowdtilt founder James Beshara, is creating a billing mechanism that can handle all the intricacies of group payments. With its APIs, the team wants to make it as easy as possible for any developer to plug in and get started instantaneously. The founder said that he’s excited to see what developers will create on the back of the new APIs, and hopes that it can help set off a wave of innovation in the crowdfunding space, along with a new wave of applications and business models that could change the way people collaborate around money. For example, a boutique travel experience marketplace like Vayable, which offers users a fun way to find things to do on vacation, will now be able to allow five friends to pay for their share of a guided tour of New York City, for example. 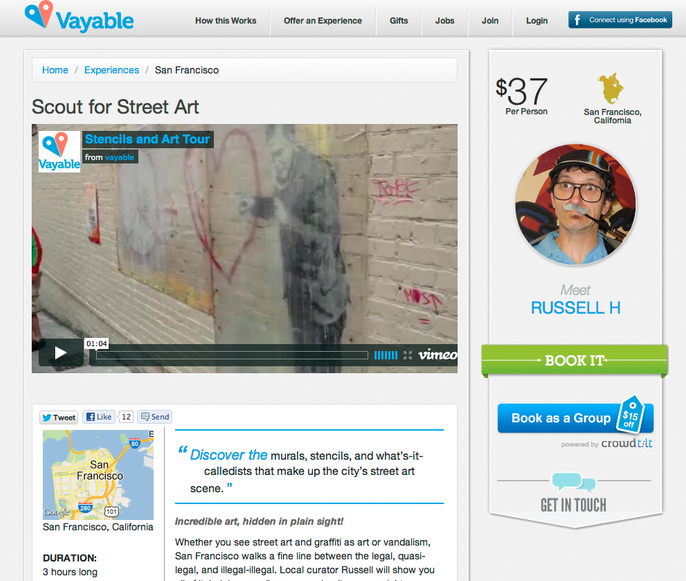 Through Crowdtilt’s APIs the travelers would only be charged once they have all paid. Furthermore, the passage of the JOBS Act has already led to booming interest in crowdfunding and, once SEC regulations are in place and the true race gets underway, one could see Crowdtilt’s APIs appealing to this new wave of entrants into the space, allowing them to set up group payments and ticketing right off the bat. As to how things look at present: According to Beshara, the platform has been growing at a steady clip since it launched in February, as users raised $1 million (across campaigns) during the its first three months and that the typical Crowdtilt campaign now raises 188 percent of its proposed goal. Crowdtilt has also begun playing host to group-funded events, like this campaign to group-fund a New Years Eve party in Las Vegas. The event features a private, chartered jet and access to an all-night party in a suite at the Palms Hotel, plus open bar, DJs, jacuzzis, etc. The average cost of a ticket is $350 per person — a favorable rate compared to what one would typically pay for a private flight and a ticket to an exclusive all-night party in Vegas. Beshara also tells us that, in addition to new startups like Vayable (mentioned above), Crowdtilt’s API is in the process of being implemented by a handful of major brands (to use for group payments, group ticketing and group-based donations). They’re not quite ready to reveal those partnerships, but plan to begin pulling back the curtain in Q1 of next year. As to cost of implementation, Crowdtilt will be waiving all fees for developers during its initial, invite-only beta launch and will set a price once testing is completed in the new year. Developers can find more information on the Crowdtilt API here. Readers can also check out more of TechCrunch’s coverage of the startup here.